The days of having to stop-and-go in a seedy, smelly or unsightly public restroom may soon be a thing of the past. The European Cleaning Journal reports that a new facility — really, an amped up version of an Interstate rest area — will open in New York City, by summer. The company, POSH Stow and Go, is seeking a limited number of ‘members’ to sign up to use its clean, soundproofed restrooms when visiting the city for shopping and sightseeing. Among the facility’s amenitities include touch-free taps, “frequently-cleaned” baby changing tables and motion-sensored toilets. The first facility opens in June in Midtown Manhattan between Grand Central and Penn stations. Besides the restrooms, the POSH Stow and Go outlet will also offer storage lockers, showers, laundry machines and a lounge area with wood floors and couches with phone-charging stations. Facility “members” will pay about a $15 annual fee plus $24 for three days’ use. If the Midtown location catches on this summer, the company will open another facility in lower Manhattan at a later date, the journal reports. QUIZ: Can You Answer These 10 Questions on Carpet Care? Does your cleaning staff know the basics when it comes to carpet spotting and cleaning? More and more cleaning professionals now include cleaning and caring for their customer’s carpets in their services. This leaves many cleaning services playing catch up, dealing with an area in which their staff may not have extensive training. 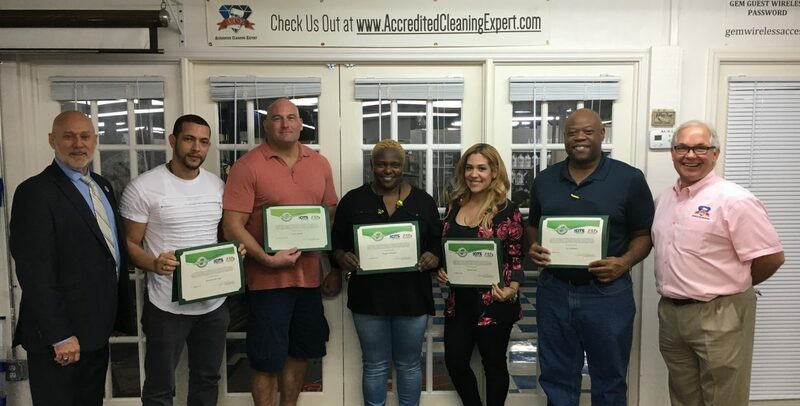 “The best way cleaning professionals can learn how to care for carpets is to take one of the many reputable courses available from many distributers and organizations,” says Joe Versluis, national sales manager for U.S. Products, a manufacturer of professional carpet and floor care equipment. Take this true or false quiz to see how you measure up, then check your answers below. 1. There are spotters now available on the market that can adequately remove just about all types of spots on carpeting. 2. When treating a spot, cleaning professionals should start in the center of the spot and work toward the edge. 3. It is always a good idea to cover a treated spot with a clean, white cloth. 4. There are two ways to clean carpets using the bonnet method: spray and immersion cleaning. 5. Carpet shampooing has been replaced by encapsulation cleaning. 6. Hot and cold water extraction are equally effective. 7. Cleaning professional often use anti-foaming agents during the extraction process. 8. It is no longer necessary to vacuum carpets before extraction because the extractor removes soils in the cleaning process. 9. One of the key benefits of pre-spraying carpets before extraction is that it gives the chemicals more time to work. 10. Some carpet manufacturers require their carpets to be cleaned using the extraction method in order to avoid invalidating the carpet’s warranty.